Curious George at the Zoo is quite interactive, easy for young children to navigate, and includes a lot of educational content. 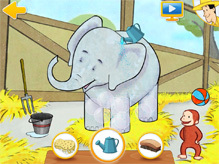 This game concentrates on facts about different kinds of animals found in different habitats. Curious George at the Zoo is an excellent choice for the younger crowd. It is entertaining, educational, and so easy to navigate that a child could likely play alone. The interactive aspects are great, as kids have to shake and swipe to clean the animals. There are extensive bonus features such as sticker pages and areas where you can drag and drop images onto a default background (or import a picture from the iPad). 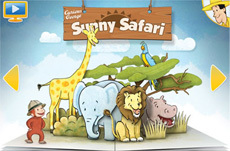 The app starts by opening up a storybook with a different section of the zoo on each page. This is awesome, except only the “Sunny Safari” section comes unlocked with the app, meaning you have to shell out another $0.99 for each of the other sections to have the full game. This immediately tacks on an additional $4 to the purchase price, since we all know how much kids love being told they can’t unlock a new game section. The app is repetitive, but this may be good for little ones, since they’ll know what’s expected of them in each section. The typical process is to wake up the animal by shaking, talking, or swiping, then clean it using soap, water, and a brush. Once bath time is over, you choose what food it should eat, and then you can watch a 1 minute video about the animal, dubbed over by the man in the yellow hat, with frequent visits from Curious George (overlayed on the video). There is one additional game that is quite easy (you spray down animals with a hose on a conveyor belt), but it’s not a highlight. The extensive drag and drop sticker section is a lot of fun, however, and the ability to import a background photo from the iPad is an excellent touch. I recommend this game despite the hidden fees, because it’s really solid for the young crowd. Please help support iPadKids by downloading the game via the AppStore icon below!